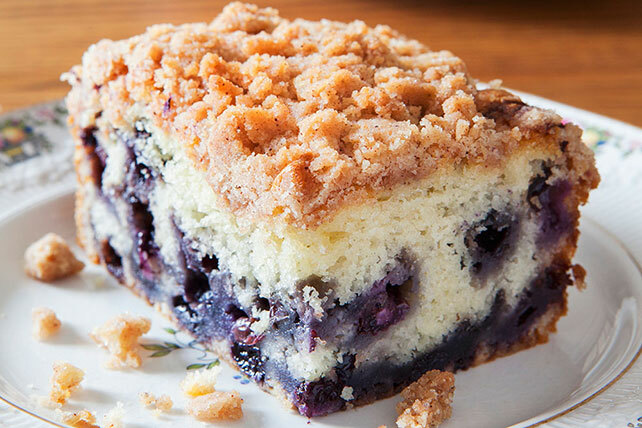 Try our Wild Blueberry and Lemon Buckle Cake recipe. This old-fashioned single-layer cake is topped with a delicious streusel topping. Line 13x9-inch pan with parchment, with ends of parchment extending over sides. Combine graham wafer crumbs, 1/4 cup flour, brown sugar, nutmeg and margarine. Beat butter, cream cheese and granulated sugar in large bowl with mixer until blended. Add eggs, 1 at a time, mixing well after each addition. Gradually beat in remaining flour. Blend in lemon zest and vanilla. Stir in blueberries. Pour into prepared pan. Sprinkle with graham crumb mixture. Bake 1 hour or until toothpick inserted in centre comes out clean. Cool 15 min. Use parchment handles to transfer cake from pan to wire rack. Cool completely. Prepare using thawed frozen wild blueberries or regular blueberries.